Idol Contest - A fan wins a contest to meet their idol. What's the story? What’s the Story – A fan that wins a contest to meet their favorite idol. 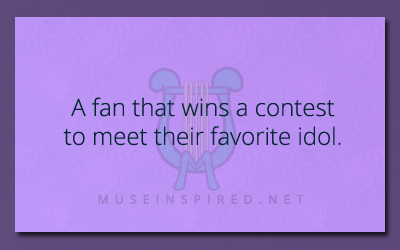 A fan wins a contest to meet their favorite idol. What happens? What's the Story? - The ice bucket turns out to have more than just ice in it. What's the Story - A deal with a suspiciously nice leprechaun. What's the Story - Everyone is watching him dance, but one person isn't happy about it.